1952: Max Ernst returns to France. 1952: Adolph Gottlieb designs the Ark curtain for Congregation B'nai Israel, Milburn, NJ. 1952: Adolph Gottlieb designs and supervises construction of 1300 square foot stained glass facade for The Milton Steinberg Memorial Center, NY. 1952: Adolph Gottlieb's first "Imaginary Landscape" shown at Kootz Gallery, NY. January 1952: Philip Guston has a solo show at the Peridot Gallery in New York. ... he [Philip Guston] worked at night, taking long walks through the deserted streets when the painting wasn't going anywhere, stopping off at the Cedar Street Tavern, the artists' hangout, to see who was there. Often, he would just be getting up when I came home from school. I'd find him sitting at the kitchen table, nursing a hangover with a cup of black coffee, coughing terribly from the cigarettes he smoked incessantly. 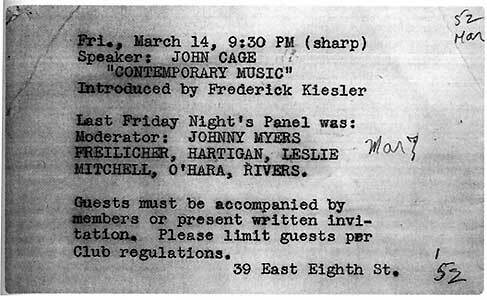 January 18, 1952: "Expressionism I" at the Club with moderator Harold Rosenberg and panelists Philip Guston, Ad Reinhardt, Jack Tworkov, William Baziotes and Franz Kline. January/February 1952: Willem de Kooning stops painting Woman I and starts again. January/February 1952: Clement Greenberg defends Barnett Newman. February 1, 1952: "Abstract Expressionism III" at the Club. February 1952: Clement Greenberg on "Jackson Pollock's New Style" in Harper's Bazaar. In Pollock's by now well-known second period, from 1947 to 1950, with its spidery lines spun out over congealed puddles of color, each picture is the result of the fusion, as it were, of dispersed particles of pigment into a more physical as well as aesthetic unity... In these latest paintings, however, the unity of the canvas is more traditional, therefore more open to imagery. Black, brown, and white forms now move within a thinner atmosphere, and around central points, not thrusting as insistently as before toward the corners to assert the canvas's rectangular shape and block it out as a solid physical object. Poet/writer Selden Rodman would also make reference to Jackson's change of style in his book, Conversations with Artists. Although he interviewed Pollock for his book in 1956, he recalls that his first visit to Pollock's studio in the Springs took place four years earlier. February 15, 1952: "Question to Lionel Abel" at the Club with speaker Milton Resnick. February 22, 1952: "Conversation with Lionel Abel" at the Club. March 7 - 31, 1952: "Jackson Pollock 1948 - 1951" exhibition opens in Paris. March 21, 1952: "Structural Concepts in Twentieth Century Art (Abstract Expressionism V)" at the Club. Moderator: Peter Busa. Panelists included James Johnson Sweeney. 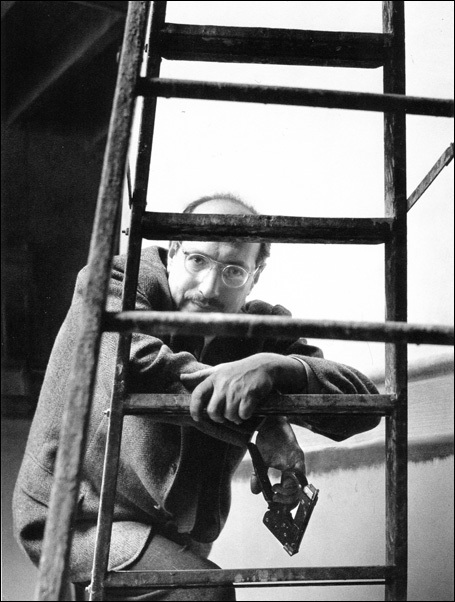 Early April 1952: Mark Rothko rejects offer to teach at Black Mountain College. April 9-July 27, 1952 "Fifteen Americans" exhibition at The Museum of Modern Art. Included Mark Rothko (who showed 8 pictures in a gallery room of his own), William Baziotes, Herbert Ferber, Jackson Pollock, Clyfford Still and Bradley Walker Tomlin. April 11, 1952: "Image in Poetry and Painting" at the Club. 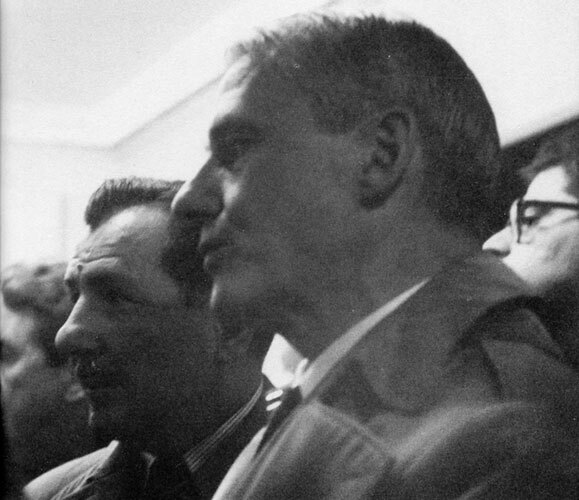 April 19, 1962: "Integration of Art and Architecture" (with slides) at the Club. April 25, 1952: "Problems of the Engaged Artist" at the Club. May 1952: Jackson Pollock joins the Sidney Janis Gallery. May 14, 1952: "New Poets" at the Club. May 21, 1952: "Abstract Color Films" at the Club. Summer 1952: Willem de Kooning stays with Leo Castelli and Ileana Sonnabend in the Hamptons. June 12, 1952: Business meeting at the Club. Summer 1952: John Cage's Theater Piece No. 1 is performed at Black Mountain College. The Cage "event" is often considered as a precursor to the Happenings of the late fifties/sixties. August 1952: Barnett Newman moves his studio to 100 Front Street. Autumn 1952: Willem de Kooning begins an affair with Joan Ward. October 3, 1952: "On Music" at the Club with speaker Henry Cowell, introduced by John Cage. Although Philip Pavia described this evening as the "Beginning of Cage influence: Zen" in Club Without Walls: Selections from the Journals of Philip Pavia, Cage had already appeared at the Club on at least three occasions: February 9, 1951, May 25, 1951 and March 14, 1952. October 31, 1952: "Artaud" at the Club with speaker M.C. Richards, introduced by John Cage. November 10 - 29, 1952: Jackson Pollock's first solo exhibition at the Sidney Janis Gallery. November 17 - 30, 1952: "A Retrospective Show of the Paintings of Jackson Pollock" at Bennington College in Vermont. December 1952: "Kline Paints a Picture" by Robert Goodnough is published in Art News. December 5, 1952: Party with Pierre Boulez at the Club. Philip Pavia described the evening as "Talking until midnight." December 9, 1952: Farewell party for David Hare. Hare was returning to Paris with his new wife, Jacqueline Lamba, who had previously been married to André Breton. (NE171) She and Breton had split up in 1943. December 12, 1952: "American Criticism of American Painting" at the Club. December 19, 1952: "American Criticism" at the Club. December 20, 1952: Mark Rothko refuses to participate in the Whitney Annual. In a letter to Lloyd Goodrich dated December 20, 1952 Rothko (who once referred to the the Whitney as a "junkshop" (RO232)) refused to submit paintings for the Whitney Annual which was being organized at the time. He also refused any potential purchases by the Whitney. December 26, 1952: Christmas party at the Club.